Funimation Films will present “Attack on Titan Season 2 Movie: Roar of Awakening” and the “Attack on Titan Season 3” world premiere as a two-night only event, July 10 – 11, 2018, in select U.S. and Canadian theaters. The “Attack on Titan Season 3” world premiere immediately follows the recap movie with a special presentation of Season 3 Episode 1 of the series. This North American world premiere will be the first ever for the franchise and is a must-see event for U.S. and Canadian fans to experience “Attack on Titan Season 3” nearly two weeks before the series’ scheduled television debut in Japan on July 22. 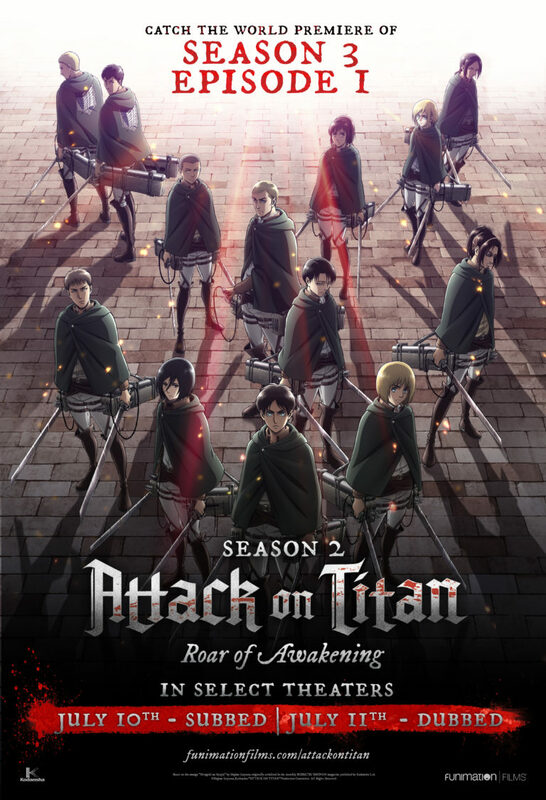 “Attack on Titan Season 2 Movie: Roar of Awakening” and “Attack on Titan” Season 3 Episode 1 have a combined run-time of 141 minutes and will be presented in both Japanese with English subtitles and English dub on alternate nights in 130 theaters across the U.S. and Canada. Produced by Wit Studio in cooperation with Production IG, the “Attack on Titan” (“Shingeki no Kyojin” in Japanese) anime series is adapted from the New York Times best-selling manga series by Hajime Isayama about the last of humanity fighting to survive against man-eating giants called Titans. To date, there are a total of 25 volumes in the manga series with an estimated 74M+ copies in print around the world.